The dingy and its outboard engine are a vital part of the cruising life, shuttling us to and from the shore, to other boats, and carrying all manner of items for us, from groceries to scuba/snorkel gear etc. Choosing the right combination has taken a lot of time and research. 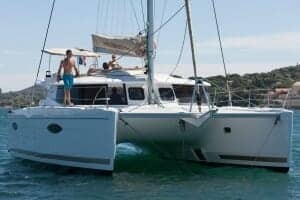 We’ve finally made our decision on which dinghy and outboard we want aboard Starry Horizons, and this post will touch on a few of the things that we weighed in our decision. 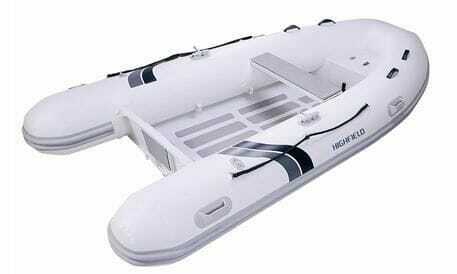 An inflatable dinghy is just as it sounds, fully inflatable, while a rigid dinghy offers a solid, V-shaped bottom. Typically, if you have limited space or significant weight limits, a full inflatable dinghy may be the route to go. 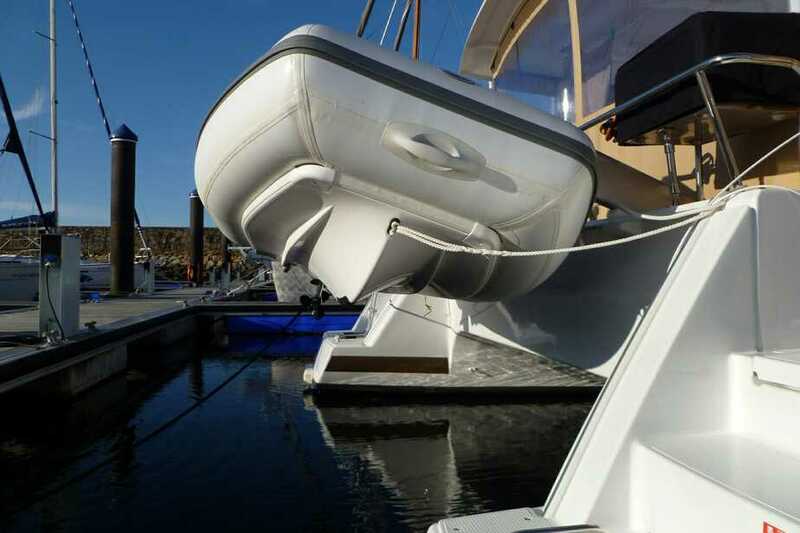 However, on Starry Horizons we have a set of dinghy davits that will be used to stow the dinghy out of the way, aft between the two hulls and will also assist in raising and launching, so these weren’t our primary concerns. We were interested in a dingy that will be stable, offer good performance and will hold up to heavy use in harsh environments like the tropics. Inflatable Pros: Lightweight; easy to fold up and store; low cost. We ended up choosing a RIB. Our davits will make the space needed for the dinghy a non-issue, and we’re electing for an electric winch on the boat to help raise the dinghy, making the weight of the dingy a bit less important. A RIB will stand up better to the uses we intend and seem to be the popular choice among cruisers. Having decided that we wanted a RIB dinghy, the next choice to make is what material you want the hull to be made out of. Most dinghy companies offer a fiberglass hull option, which do provide a lot of benefits, but could be more easily damaged on rocks in comparison to an aluminum hull. In this instance, weight was a big factor that caused us to go for an aluminum hull. Some of the aluminum hull dinghies weight almost 45% less than their equivalent fiberglass counterparts. The Helia dinghy davits are rated for a total of 220 kg, or 485 lbs and I knew we wanted a large outboard engine so we could go fast. Saving weight with an aluminum dinghy means we can get a large outboard and still come in under the davit weight limit. In addition, some of our eventual cruising grounds are likely to have rocky beaches and an aluminum hull will hold up better over the long term. This is in reference to the fabric used to create the tubes of the dinghy. Hypalon is a neoprene-coated nylon and the seams are hand glued while PVC seams are usually heat welded. We decided to go for a Hypalon dinghy. The additional upfront expense will be worth it in the increased life of the dinghy as we sail in the tropics. We’re also going to look at buying or having “chaps” custom made, which cover the inflatable tubes and further extend the lifespan. This decision was a tough one for me. I really like the idea of having a dedicated steering console for the dinghy with a bench seat facing forward. The alternative requires you to sit on the tubes and steer using a tiller extension from the outboard. However, in the end I couldn’t justify the additional cost and weight of a center console so tiller steering it is. After looking at lots of dinghies offered by various companies, we ended up deciding on a Highfield Classic 310 Aluminum Hull dinghy. 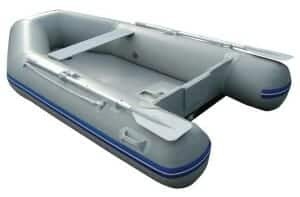 This is a 10′ dinghy that offers an optional upgrade to the Hypalon fabric, as well as a bow locker that can fit up to a 12-liter fuel tank. It has a long list of standard equipment and seems to be well-liked by those people who have cruised with one and overall seems to offer the best combination of features and price that I could find. Once we made the decision, we then looked at buying one in the United States and shipping it to France in preparation for our crossing but decided that it will be easiest to work with a dealer in France. It will be a bit more expensive to buy the dinghy there and suffer the USD/Euro exchange rate, but the bulky size would make for difficult shipping. The size of the outboard should actually be driven by the dinghy that’s been chosen. Dinghies are rated for a maximum horse power capacity, which varies based on the length, weight, and type of hull. For the Highfield Classic 310, they recommend a 10hp outboard, with a max of 15hp. So what did we do? Went for the max size of course. After that easy decision was made, I evaluated 2-stroke vs 4-stroke outboards. A 4-stroke outboard is very similar to a car engine. The air-fuel mixture flows into a combustion chamber through intake valves, gets combusted, and then the exhaust exits via exhaust valves. A 2-stroke is simpler and has the air-fuel mixture enter the combustion chamber through an opening in the side of the cylinder and then after combustion, the exhaust exits via a different port in the cylinder. Traditionally, a 2-stroke engine has weighed less than equivalent 4-strokes, but they aren’t quite as efficient and require the oil and gas to be mixed together. 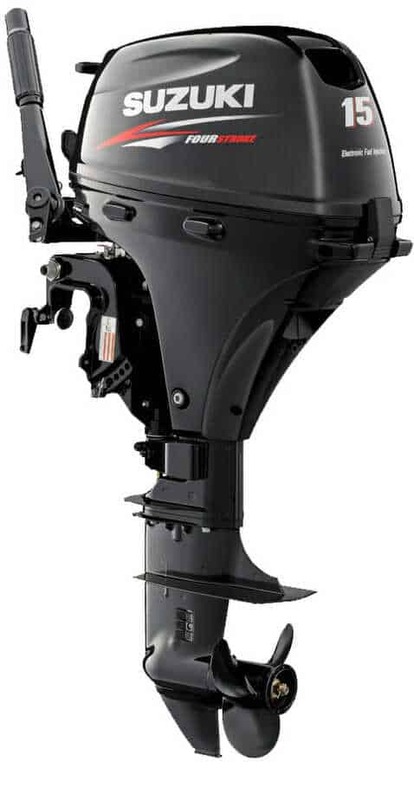 Modern 4-stroke outboards are still a bit heavier, but have cut down the weight difference substantially, and also offer smoother performance as well as significantly less emissions. We want to be good citizens of the world and with advances in technology continuing to drop the weight of 4-stroke engines, it was another pretty easy decision. Four stroke engines are easily available here in the US, and we didn’t want to wait until we arrived in the Bahamas to have an outboard for our dinghy. 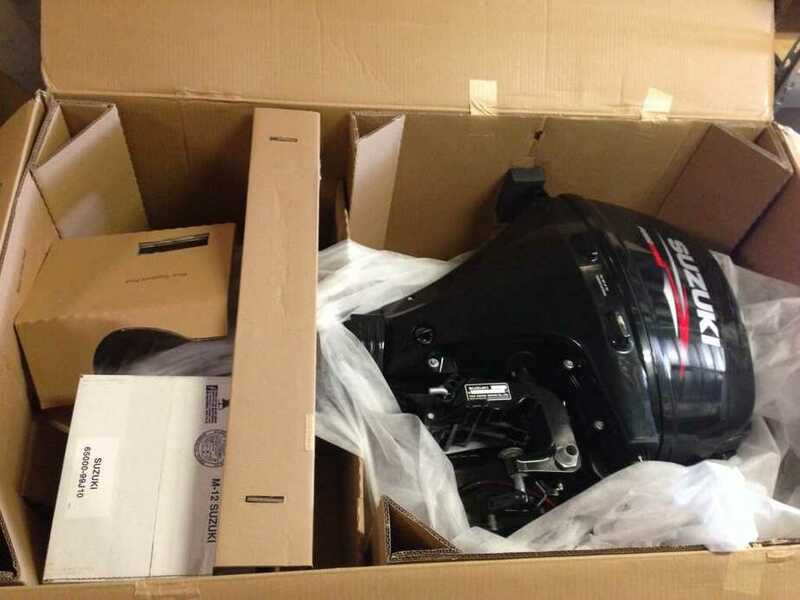 There are a lot of outboard manufacturers to choose from, and we have experience with Yamaha, but we decided to go with a Suzuki 15hp, electric start outboard. These outboards use the latest in battery-less Electronic Fuel Injection technology, which means they don’t use a carburetor and after all the issues we had on the Star Cat with the carburetors on her old Yamaha outboards, I’m keen to avoid them again. The Suzuki is also the lightest 15hp outboard in it’s class, which is a plus. We did elect to go for an electric start model, which means we can hook up a small battery and start the engine at a push of a button, rather than having to continually pull the starter. I was able to find one of these outboard on sale online, and after ordering it last week, it arrived within 3 days which was impressive! For now we’re going to store it at Star Fleet, and if we can ship it to France with everything else, great. If not, then we’ll just take it to Florida for when we arrive and will row our dinghy whenever we need to get somewhere on our crossing. The easiest part of this whole process? Coming up with a name. We’re going to call our dinghy Little Dipper. That seems pretty appropriate to us. Great posts and source of information. We have been working on our new Helia for about 3 yrs now with the order actually going in, Mar 2017. It is planned to transport and splash tomorrow, May 15th, yaaahhh! My question is, we have settled on the Highfield dinghy, as they seem the best option and many FP owners also use them. I noted you purchased the 310 do you feel that we would be in difficulty if we went up to the 340 at 11′ 2″ long. The main reason is the 6 people capacity. I cannot find the actual inside beam measurement at the sugar scoops. Dealer has advised it is OK, but wanted to ask a pair of owners with a 310? Thanks in advance, happy sailing and travels. Thanks David! Boatshow in Annapolis this weekend and we’ll be looking. Greetings from Annapolis! Michelle and I own JADE a 44 Orana (#79) and have used a Kiwi 9.5 RIB for the last four years with a Honda 9.9. We are in the hunt for a slightly larger dinghy, AL hull and have been looking at the Highfield CL310 Hypalon and the AB equivalent 10AL. Saw your blog (great site by the way) and your systematic approach for your dinghy selection…nicely done and explained, thanks! We are wondering after about a year of use how you are finding your Highfield to be. If you wouldn’t mind sharing what you’ve discovered about the boat we’d greatly appreciate it. Best of luck in your upcoming travels! Thanks for reaching out to us and glad you find our site useful! So far we are really enjoying Little Dipper and are pleased with the Highfield CL310. The combination with the 15hp outboard handles well and we’ve been able to get on a plane with 5 people on board (albeit at full throttle!). We’ve had no problems with construction quality and we’ve only had to add some air to the tubes once we got North to colder climates. My only gripes so far are that the rowing setup isn’t great (but we’ve only rowed for fun, not out of necessity), we haven’t found a fuel tank that would easily fit in the forward locker (and even if we did, it would take up pretty much the whole locker), and there isn’t a really easy way to set up a dinghy anchor. However, these are all pretty minor. One thing I will add is that if you do go the Highfield route, make sure you specify that you want the front locker. I talked to a few dealers, and some said it was optional and some said it was a standard feature. Still not quite sure which it is.